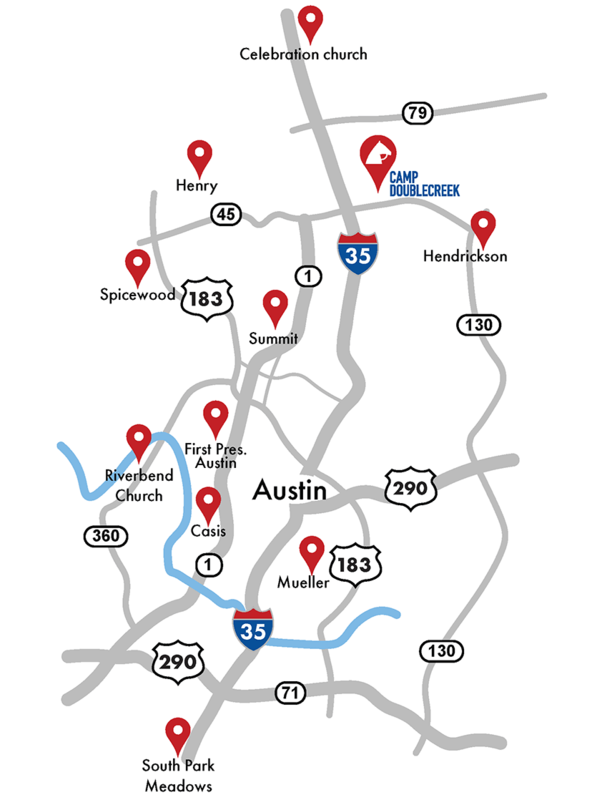 Camp Doublecreek provides free transportation by bus, van or other camp vehicle to and from 12 different locations around the greater Austin area. All campers arrive and depart from the campus by bus, van or other camp vehicle. Counselors are available at each location beginning at 7:30 a.m. each morning and the vehicles depart for the camp between 7:40 a.m. – 7:55 a.m. depending on the distance from the campus. Camp vehicles return to the pickup points between 4:30 p.m. and 5:00 p.m. We just ask that you pick up your camper(s) by 5:30 p.m.
Open Houses are held every Saturday, April – July from 10:00 a.m. to 12:00 p.m., as well as March 16th and Wednesdays, 4 p.m. – 6 p.m., May 15 & 22. Click here for map to Camp Doublecreek. * These pickup points will not be used during Spring Break Camp. ** Steiner Ranch pickup point will only be available Week 4. Parents are asked to pick up their children by 5:30p.m. at the latest. Persons picking up children at the pickup points must be on the pre-approved pickup point list and will be asked to provide identification (driver's license) in order to retrieve campers.